Isaac Lowe announced himself on the big stage with a punch-perfect display to stop Jamie Speight and lift the English featherweight title. Morecambe’s Westgate Warrior navigated his first major step up with aplomb at the First Direct Arena in Leeds live on Sky Sports with referee Howard Foster bringing a halt to proceedings in the ninth round. Victory saw Lowe, who moved to 11-0 (4 KOs) with the win, become the first person born in the Lancaster and Morecambe area to win a national professional title in more than 30 years. The 21-year-old said: “I feel like I’ve won a world title. “I’m over the moon. I’ve trained so hard all my life to fight on a stage like this. 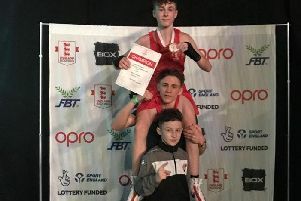 Lowe, who had good friend Tyson Fury ringside on the night, dominated the opening rounds with his superior skills and speed before Southern Area champion Speight rallied in rounds four and five. Morecambe’s rising star was always the classier operator however and after having his rhythm disrupted he took control once again. Pacing the fight to perfection Lowe decisively broke through the Devon man’s defences in round nine with Foster stepping in one minute and 49 seconds into the session with Speight not responding to a barrage of punches. In the main event home favourite Josh Warrington dominated Joel Brunker, defending his WBC International and Commonwealth featherweight titles with a wide points win. There were also stoppage victories for Tony Bellew and Martin Murray on the card ahead of possible world title shots.